Oh boy, it's happened again. SYDNEY -- First there was Boaty McBoatface from the United Kingdom. Then came Boaty's cousin, Trainy McTrainface from Sweden. 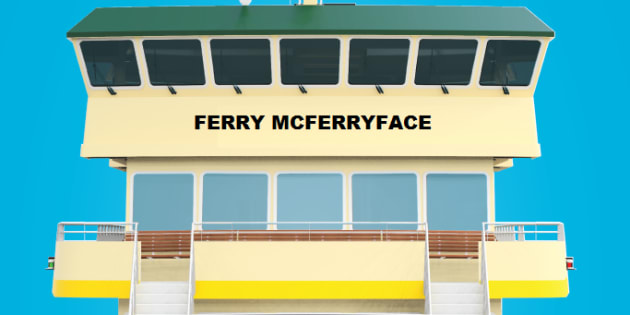 Now, Australia will welcome the newest addition to the viral online trend that has captured the hearts of the world -- everyone, welcome Ferry McFerryface to Sydney Harbour. The New South Wales government's public transport body announced on Monday night that the label has officially been picked as the name for its newest ferry after it was deemed one of the most popular from a public competition voted on by hundreds of Sydneysiders. And while 'Boaty McBoatface' actually received the highest number of votes, NSW Minister for Transport and Infrastructure Andrew Constance said it was avoided in order to prevent a duplicate after a UK research vessel was dubbed with the same namesake in 2016. "Given Boaty was already taken by another vessel, we've gone with the next most popular name nominated by Sydneysiders," he said. "Ferry McFerryface will be the harbour's newest icon, and I hope it brings a smile to the faces of visitors and locals alike." With more than 15,000 suggestions made to the public competition, Ferry McFerryface will join the likes of its NSW ferry counterparts which have already been given names -- Victor Chang, named after the Australian heart surgeon, Fred Hollows, after the ophthalmologist known for restoring eyesight, and Catherine Hamlin, the famous Sydney-born obstetrician. The decision comes as part of a running online joke that has been around now for more than 18 months after Boaty McBoatface turned into a viral hit that spread globally -- and boy did some of McFerryface's critics online know it. In the end, Boaty was ultimately renamed as the RRS Sir David Attenborough after the original label was deemed inappropriate for the research vessel. Here's to hoping Ferry McFerryface lives a longer life along the waters of Sydney Harbour.